Happy One Year Anniversary Oddly Aroused! - Oddly Aroused! Happy One Year Anniversary Oddly Aroused! Well here it is! 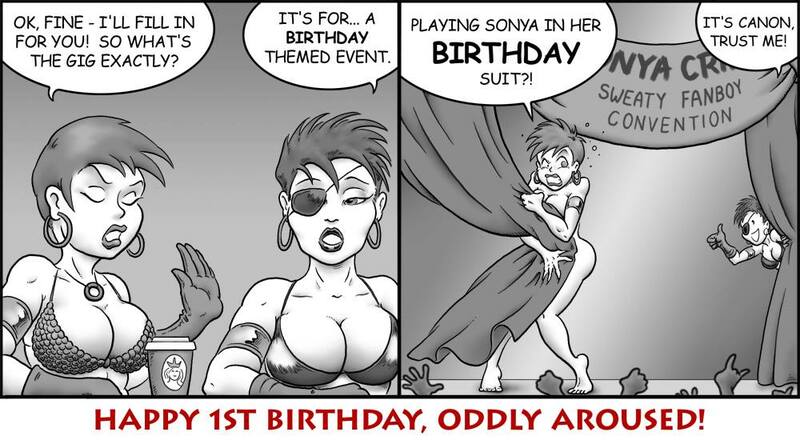 It’s been one year today that I put the comic, Oddly Aroused, online. I timed it in conjunction with the Hamilton Comic Con, which was the grand unveiling of the strip. I’m very happy with the direction that Sonya and her comic strip have been going and I’m excited for what the future will bring. The site obviously isn’t quite where I want it to be, yet. I’ve put it all together myself with kind of a hit and miss attitude, without any outside help. Frankly, I’m surprised that I’ve managed to do as much as I have, having no technical know how whatsoever. The important thing to me was to get the strip out there for people to see. A few weeks back, I almost reached 900 views for that particular strip. I know that’s not many to most webcomic artists, who are used to views in the thousands, but it made me feel pretty damn good and proud of what I’ve accomplished so far. I hope to keep building an audience and to eventually (with luck, soon) get the gallery and archives up and running. I think I made a few tactical errors building the site that might make that difficult, but it will get done one way or another. As a special Anniversary bonus, I’m including an awesome piece of artwork by Åke Rosenius who draws the Birger Barbaren strip for Sweden’s Fenix magazine. He was generous enough to do this out of the goodness of his heart and send it on to me. You’ll be seeing more of Agnes’ s dark sister, Trudy soon and find out why they are now arch enemies. So, stay tuned, Sonya-watchers! You’ll find Åke’s work here. Yeah, I noticed that paws4thot. I got a few hits through them. Thank you for that! Congratulations Darling on this the 1st anniversary of Oddly Aroused. I am so proud of you and your accomplishment with this strip. You created it from scratch. The characters, the website… all your hard work paid off. A year already. Wow. Heres to many more, and greatness from quiet begginings. Thanks, balthazar. That’s a wonderfully poetic sentiment that I’ve never heard put that way before.